EQ was originally created when scientists tried to create a longer acting injectable version of Dbol. Sort of by accident, EQ doesn't really behave similarly to Dbol even though they are very similar on a chemical scale. EQ is very similar to testosterone which actually puts it closer to Deca. It features a very slow aromatization which happens at roughly half the rate of testosterone. 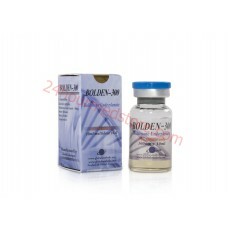 This means that it has very low estrogenic side effects with excellent results for bodybuilders of both sexes. Ultimately athletes find EQ extremely favorable due to its slow acting results. Most athletes generally use it for around 12 weeks time and it helps them to achieve a slow build up of muscle from an ester that stays in the body over a long period of time. This means that with EQ athletes can see much more natural results with a moderate performance boost. Rather than simply gaining mass athletes start to gain real strength and quality lean muscle. It's extremely versatile and has some amazing performance benefits for training. The best part about EQ is its low side effects and extremely reasonable price. Because of its widespread availability and very low recorded side effects many athletes will be continuing to use it for years to come. Most bodybuilders find in ideal dose to be around 600 mg a week through the 12 week cycle. It is usually best to start with around 400 mg in the first week and then jumped to 600 mg later on to start seeing the gradual increases and to be sure that your training is and pushed too far. Women should consider a slightly smaller dose but EQ is still 100% safe with its low side effects and heavy recorded use within the women's bodybuilding community. Over the course of a 12 week cycle you shouldn't need to take any type of ancillary drugs to combat negative side effects. Water retention is virtually unheard of with EQ and the only precautionary measure you might want to consider is a PCT plan to normalize your body chemistry and to ensure that you can continue producing natural testosterone after your cycle.